Connected via WiFi. Flight arrived right on time. I sure got spoiled traveling on business...Coach seating is really tight. Give me Business Class any day! About noon local time. got a couple hours to kill. Oh and free WiFi? Not here...*grins* Of course, I didn't 'spect it to be. Flight was uneventful aside from the crampiness. 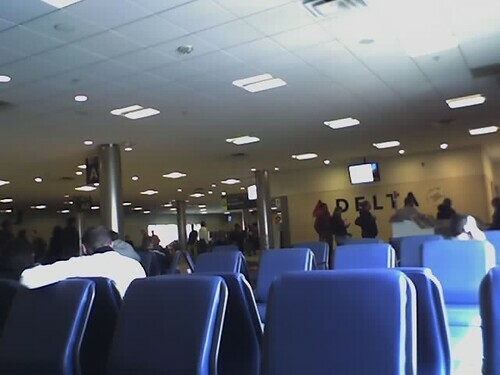 Can't really take a decent picture as I had to put the camera im my checked bag. Just would not fit in anything else. So this one from my phone will just have to do. But I haven't had near the discomfort in my ears as I usually experience. Hmmm my ears and sinuses are connected...Who knew? LOL! Think I'll look into having movers pick up the furniture and drag it back to Texas. Can't be any worse than the deficit in my wallet UHaul is gonna cause. FARK! I'll just have to see.